View More In Labels & Stickers. Our glossy sticker paper can be used for mail stickers, shipping labels, package labels, barcode labels, return address labels, labeling files and folders. It is widely used in office, school, home or other occasions and perfect for stickers, labels, signs and packaging identification, etc. Package - 65 Sheets/Set. The full sheet label paper comes with a clear document folder as bonus. Printable - This white sticker labels can be printed with laser and inkjet printers. Strong Permanent Adhesive - This self adhesive sticker paper can adheres well to most surfaces and is not repositionable. Widely Use - Our glossy sticker paper can be used for mail stickers, shipping labels, package labels, barcode labels, return address labels, labeling files and folders. 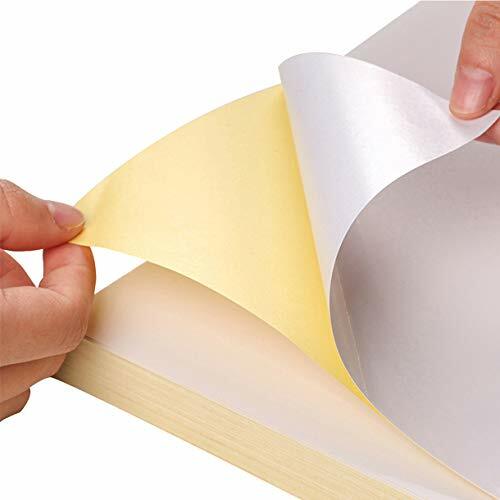 It is widely used in office, school, home or other occasions and perfect for stickers, labels, signs and packaging identification, etc. If you have any questions about this product by Hapree, contact us by completing and submitting the form below. If you are looking for a specif part number, please include it with your message.